Iñaki Bergera presents to us Twentysix (abandoned) gasoline stations, a work that projects ciphers and hidden messages for its interpretation as soon as you read the title. You cannot fail to notice the idea of revisiting and paying homage to Ed Ruscha’s celebrated book, Twentysix Gasoline Stations, published in 1963. That work by Ruscha has been artistically replicated innumerable times by different artists and our photographer has decided to add his own tribute. It is a fundamentally formalist and aestheticist tribute, but nevertheless offers us a reading that is also paraliterary andnot strictly iconic. I am referring to the reading of aspects relating to the North American vernacularculture, as seen through its commercial/industrial architecture (recorded by Bergera in the purest tradition of American documentalism: some of them could have been gas stations photographed during the Great Depression of the 1930s), of the relationship between the natural and the altered environment, of the aesthetic anonymity that ends up producing the standardisation of capitalism (similar constructions, similar advertising), of the current development policies regarding fossil fuels and new road networks (with the old interurban gas stations being abandoned in the 1990s), etc. 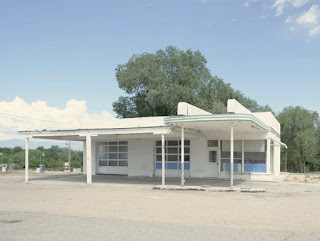 Bergera’s work also has a nostalgic (rather than historicist) tinge that we do not see in Ruscha’s (in1962, the year in which he took his photographs, the now-abandoned gas stations were actively working at full capacity and Ruscha examined them from a critical pop perspective). Bergera (his work) cannot hide his academic and professional training. From the aesthetic point of view he builds (records) his scenes with a meticulousness and balance worthy of an architect. His pictures are fine marquetry. No fault is detectable in the balance, form, composition, framing, perspective, light, or colour. As regards their narrative tone, the pictures are beautifully sober, minimalist, and measured. It is worth emphasising the tone of contention, because it refers to the cold (and exquisite) rationalism of modern architecture (less is more). We find therefore in Bergera’s work a curious modern/post-modern conjunction (post-modern in the sense that it is a project that revisits and appropriates —intelligently— what has already been done). From the methodological point of view, this work is Cartesian, archival, taxonomic, systematic, and classificatory; it creates an album, a collection, a series. In any case, it is a reference archive. The systematic topographical information in the manner of concise captions is a prolongation of the modern (rather than post-modern) austerity of Bergera’s photographs. I do not know if what Bergera photographs can be defined as industrial archaeology or whether they are just the architectural remains of an earlier failed energy development policy. What we can affirm, however, is that these abandoned architectural structures stand steady and immobile and, as such, they are becoming symbols of a past in which they had splendour and purpose. In any event, the important thing is that when they are photographed by Bergera we find them almost moving.